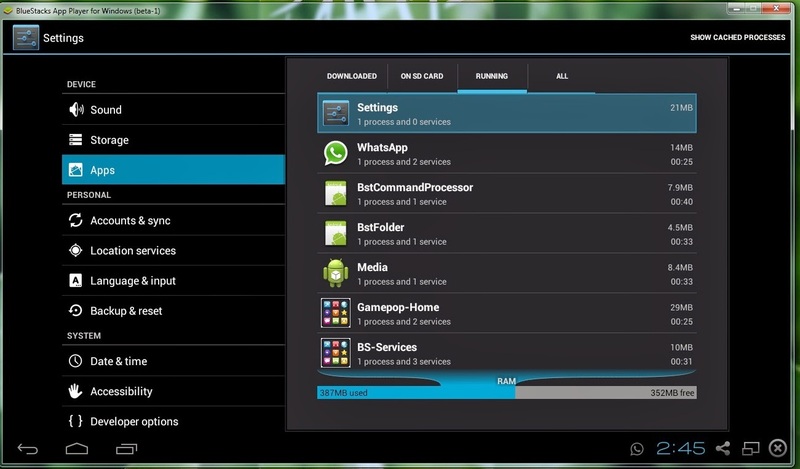 Today I am going to show you a trick on how to increase RAM/Speed of Bluestacks. This increase the speed and makes the processes Faster than Before. Step 5: Now see on the Right hand side. Find MEMORY . Double click on it. Change to Decimal from Hexadecimal . You can see that the value is 768. Now Change it to 1024. Note: Keep values according to the specifications of your PC. Dont SHARE more than half of your PC RAM . Step 6: Now close it and RESTART your PC. Step 7: Open BLUESTACKS.Go to the path as of STEP 1.You will be able to see that the total RAM would be Approx 850 MB Usable. According to me this is the Maximum RAM which a blustack user can use. none inside them is hdquit so I try to exit the process by using task manager. We can get only 850 MB RAM in bluestacks.This is the maximum which bluestacks offers. More over you can quit bluestacks from the TASKBAR also. Won't load after following your instructions. Goes through blue loading screen and then goes black. Any advice? Please Change RAM according to your PC configuration otherwise it will slow down your PC. Check the below Link for your problem solution. You might have exceeded the RAM limit more than necessary. Follow same steps and assign the RAM which was before. If you do not get your RAM back then delete Bluestacks and reinstall it. If all these dont work then the possible reason is that , you might have corrupted your RAM by assingning more than its capacity. I really don't think this helps at all, sort of a placebo effect. It might of helped if the max usable memory wasn't limited to 850MB in Bluestacks. Yes. This does not help much but it is useful for those who have installed too many applications. Hoping further versions will increase RAM limit beyond 850 MB. Please tell how to increase graphics quality??? whenever i try it always says "Cannot edit Memory: Error writing the value's contents." what do i do? can you help me to fix the problem i occur when i launch shadow fight 2 on bluestacks, it says "unfortunately shadow fight 2 stopped". i have uninstall it and reinstall it many time but it didn't work. You have to report that app to Bluestacks so that they will try to make it work in their next update. Zaid Mansuri can you give me the Bluestacks download link.I download it once but it did not install .It says Bluestacks can not install. Please retry. If it does not happen then comment here your problem. Hi. I tried this but didnt see any difference. I use to be able to run Clash of Lords on bluestacks but it was slow. Played 1sec of game every 2-3secs. I did a factory restore on my pc "vista". Downloaded the latest service pak/flash player. Now the game wont even get past first few secs after opening. My pc im using for this is older but has 3gb ram/1.83ghz. If i create a virtual sd card would this help my game to play at a normal rate ? No. All you need is a good graphic card or you can try in win 8 OS. When i change the memory. It said, cannot edit memory: error writing the value's new content. What should i do?? My Laptop RAM is 8GB. But my Bluestacks apps is only approx 2GB on running apps. So i can set 4096 or still 1024 at max??? I cannot play Asphalt 8 in my bluestacks. When I open Asphalt 8 in my bluestacks its only black screen, I cant see anything else. 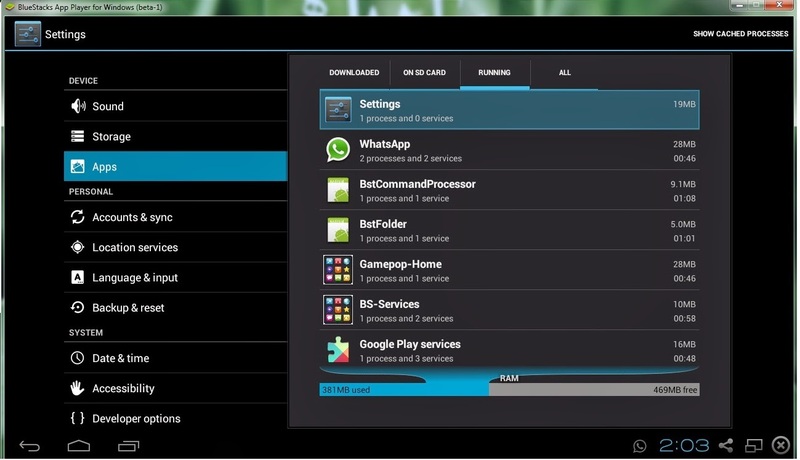 hello, this method is not working at all for me...i do not want to play games on bluestacks, i just want u use it for my whatsapp and imo ... how would i make it lot faster by deleting or disabling some gaming or other stuffs to run only Whatsapp and IMO .. thank u.
i try change from dex to hema .. it show 1410 .. what should i put ? my ram is 2gb of pc so what value should i put in haxadecimal ..